Hi there! Just another simple black&white vectored wallpaper. Just like the other two, it wasn't really planned. As you can see on my userpage, there are other beautiful scans I want to vector. However, since Bathroom Bubbles, I am too afraid to vector them. I am afraid if they would look like Bathroom Bubbles. Erm, thats a good opportunity to learn more about vectors and to improve. 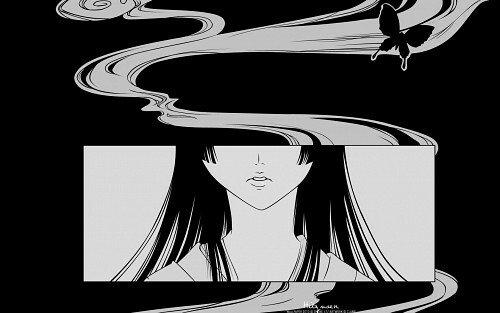 The original scan was from a xxxHOLiC Doujinshi I found somewhere on the internet. I really like it, however the vector looked different from the scan. I don't know what happend. But I know that the smoke looks - I don't know how to say- strange? Nice job using just gray scale and the vectoring is neatly done. Keep it up! Pssst, don't forget your signature! Nicely done, I really like drawing of smoke. Somehow it gave strange atmosphere feelings. Add to favourite! AHH I love it. It's so cute. I love the grayscale XDD I haven't heard from you in a while my friend how's it been? I love the greyness xD! And the background especially... hehe ! This is amazing. Thanks for sharing!